Councillor Alan Fakley at the Upperton junction. Locals are calling for change at Peterhead junction now infamous for becoming “overloaded” with traffic at peak times. The Upperton junction, where the Upperton industrial estates road joins the A90 Peterhead to Fraserburgh bypass around the town, suffers from congestion at rush hour on a daily basis. Local businesses rely on the road to transport goods and large vehicles often use the junction. 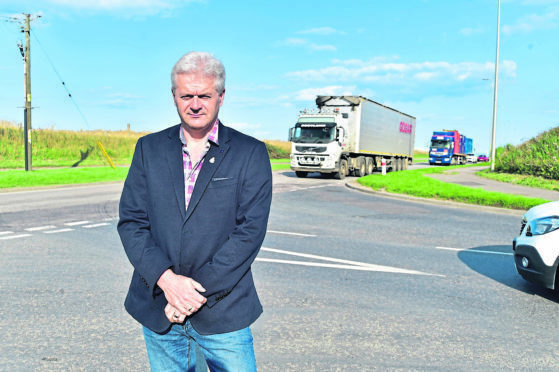 The result, however, is that the route is often left in gridlock and Peterhead South and Cruden councillor Alan Fakley has now raised concerns about safety and suitability. He wants consideration to be given to the introduction of a mini roundabout to improve traffic flow. Conrad Ritchie, managing director of Score International Ltd, which is located a short distance from the junction, said the problems were also “impacting business”. Mr Ritchie said: “The junction at Upperton is not fit for purpose. “HGV traffic is increasing as a result of a recovering economy, while employee numbers on the Upperton and Wellbank industrial estates are increasing year-on-year. “Commuting delays at peak times are having a negative impact on business and the safety of all road users. On Tuesday, councillors raised concerns about connectivity around the Buchan Gateway, with many voicing unhappiness at the traffic planning in the area. Despite that they granted approval for a new petrol station and facilities at the Invernetty roundabout. Upperton Junction, a short drive from that site, has similar traffic flow concerns. Councillor Fakley said: “Upperton is an important junction serving a large part of the Peterhead engineering sector. “It has two issues. The first is it becomes overloaded at peak tines with the sheer level of traffic and the second is that HGVs are damaging the road surface when entering the junction. “To date I have written to Transport Scotland twice about the issue but been unable to engage with them which is very frustrating.